Fort Lauderdale is often referred to as the "Venice of America" because of its numerous canals and 300 miles of navigable water. 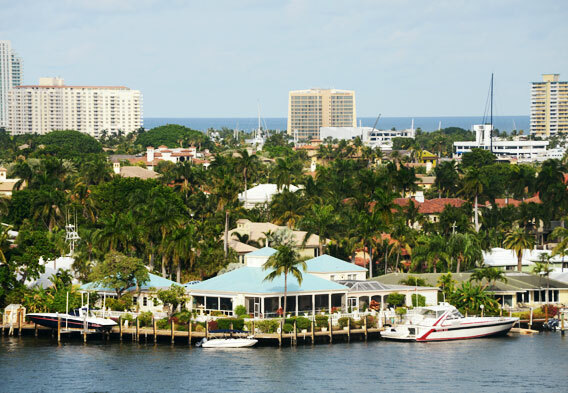 Fort Lauderdale is also called the "yachting capital of the world," as it boasts a major yachting industry. Its relative proximity to the Bahamas and the Caribbean makes the city a popular yachting vacation stop. Fort Lauderdale is named after a series of forts that were built by the United States during the Second Seminole War (1835-1842). In turn, these forts took their names from Major William Lauderdale, who commanded the detachment of soldiers who built the first fort. While Fort Lauderdale is not technically found in the tropics, it features a tropical rainforest climate. The Fort Lauderdale Swap Shop is a large indoor/outdoor flea market site that features the world's largest drive-in movie theater. Fort Lauderdale is commonly referred to as the "Venice of America." Found on the southeast coast of Florida approximately 25 miles north of Miami, the city has numerous canals and boasts some 300 miles of navigable waterways. Fort Lauderdale is also known as the "yachting capital of the world." Approximately 100 marinas and boatyards call the city home, and the relative proximity of Fort Lauderdale to the Bahamas and the Caribbean makes it a popular yachting vacation stop. Other things that lend to the popularity of Fort Lauderdale as a vacation destination include the city's beaches, its wonderful beach resorts, its cruise port, and its mix of shops and restaurants. Add in the proximity of the Everglades and other regional cities such as Boca Raton and Miami, and it becomes clear that there is no shortage of ways to stay busy during a Fort Lauderdale escape. The days of Fort Lauderdale being a major spring break destination are pretty much over. The city now attracts a more affluent crowd that is better behaved, and some of the resident beach hotels reflect that. Take the W Hotel Fort Lauderdale, for example. A luxurious retreat, it impresses with its healthy mix of amenities and its wonderful oceanfront location. Other upscale Fort Lauderdale beach hotels that have little trouble keeping their guests happy include the Westin Fort Lauderdale, the Bahia Mar Fort Lauderdale Beach, and the Ritz-Carlton Fort Lauderdale. For travelers who have something smaller and more affordable in mind, there are options there as well. One example would be the reasonably priced Silver Seas Beach Resort. 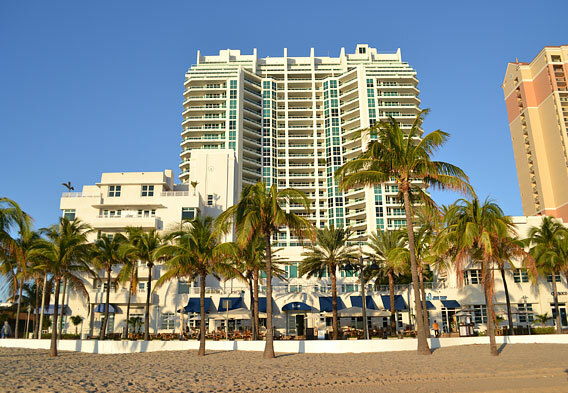 There are Fort Lauderdale beach hotels to satisfy a range of tastes and budgets, and all of them are found on or near Florida State Road A1A, or Fort Lauderdale Beach Boulevard, as this major coastal thoroughfare is also known. Thanks to its location in Florida's Gold Coast region, Fort Lauderdale offers proximity to any number of fantastic beaches. In Broward County alone, there are more than 23 miles of beaches. These beaches figure among the region's most popular and amenity-laden strips of sand, and they are all well maintained. In Fort Lauderdale proper, more than seven miles of beaches await, and the city recently renovated its signature beachfront promenade. Unusually clear waters are found off the beaches of Fort Lauderdale. Popular beach activities include playing volleyball, swimming, windsurfing, snorkeling, boating, jet skiing, and scuba diving. Also, the promenade is great for strolling, jogging, and rollerblading. Fort Lauderdale visitors who are interested in spending time at the beach won't want to overlook the city's Hugh Taylor Birch State Park. It's a wonderful oasis where you can mix nature with your beach experience. Also of interest are the many other great beaches near Fort Lauderdale. In neighboring Dania Beach, for example, you can find John U. Lloyd Beach State Park. This park consists of 251 acres of barrier island and boasts a flat, broad beach that is ideal for sunning and swimming. The list of things to do in Fort Lauderdale is extensive. Boating, deep-sea fishing, and spending time at the area beaches figure among the most common ways to stay busy. Shopping, dining, and enjoying the nightlife are also popular pursuits in Fort Lauderdale. Las Olas Boulevard with its shops, restaurants, and bars is the main strip in town. Shoppers can also hit the area malls, which include the Sawgrass Mills outlet center, or indulge in the numerous antique shops in nearby Dania Beach. If you need even more ideas for things to do in Fort Lauderdale, you can golf at one of more than 50 area courses, play tennis on one of the hundreds of courts in Broward County, visit such historical sites as the Bonnet House and the Stranahan House, or get some cultural exposure at the city's museums. Noteworthy Fort Lauderdale museums include the Museum of Discovery & Science, the Museum of Art Fort Lauderdale, and the International Swimming Hall of Fame. Major annual events in Fort Lauderdale include the Broward County Fair (November) and the Winterfest Boat Parade (December).